Doctors have been telling us for years that stress can increase the risk of everything from high blood pressure to depression. But how often do we think about how stress influences our smile? Here are some dental problems linked to stress. Cold sores are a symptom of the herpes simplex virus. Scientists don’t know exactly what causes canker sores but suspect they are related to infection, virus, or a weak immune system. If you are prone to mouth sores, you probably already know that stress seems to bring them on or prolong healing times. If you frequently get these sores, communicate with your doctor or dentist. Your healthcare provider can advise you on medications, diet, and stress reduction techniques. It’s no surprise that teeth grinding (bruxism) is bad for teeth. It starts with enamel wear, then loose teeth, and eventually tooth loss. During this progression, there may be other issues such as gum recession, headaches, and TMD (Temporomandibular Disorders). If you grind your teeth, it’s important to address this condition as soon as possible. 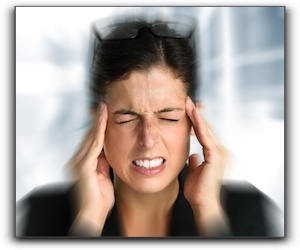 In addition to stress, there are many factors that can cause or exacerbate bruxism. These include: malocclusion (bad bite), sleep apnea, and prescription depression and anxiety medications. Your dentist may prescribe an appliance to protect your teeth and keep your jaw in the proper position while you are sleeping. Other treatments include cognitive behavior therapy, relaxation therapies, mandibular advancement devices, physical therapy, and medication. Your dentist can create a treatment plan and work with you and your doctor to manage or eliminate this condition. There are many direct and indirect causes of TMD. For example, inability to manage stress may cause jaw clenching which, in turn, causes pain in the jaw joint. Other symptoms of TMD include tenderness, pain, or swelling in the neck, ear, face, or shoulder; popping or clicking sounds; and changes in bite alignment. Again, if you experience any of these, meet with your dentist. Stress can reduce your ability to fight plaque build-up which can cause gum disease. Some people forget brushing and flossing when life becomes problematic. It’s not uncommon for people to consume more sugar, snack more often between meals, or drink more alcoholic beverages when experiencing increased stress. All this at a time when vigilant oral hygiene is often not a person’s first priority! Tooth pain and untreated dental issues will only give you something else to worry about. Let’s nip this vicious cycle in the bud. I’m Dr. Steven Do. If you haven’t seen a dentist in a while and are experiencing an unusually stressful period, I invite you to schedule an appointment with me by calling Providence Dental at 702-852-2244. Let’s determine the status of your oral health, schedule treatment if necessary, and create a plan to restore and maintain a healthy smile. My convenient dental team will make you feel relaxed during your stress-free visit to our comfortable Las Vegas office. Remember, a healthy smile will give you one less thing to worry about.